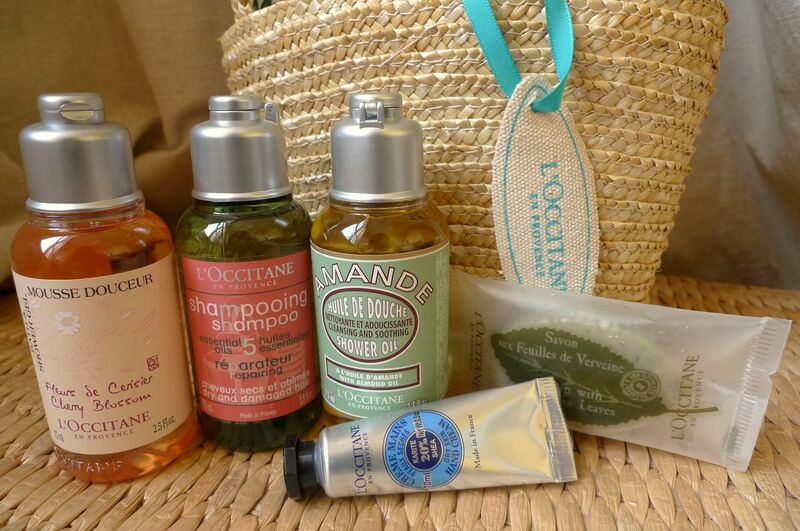 The other day I went to L’Occitane to replenish on facial wash, toner, and moisturizer. I’ve been using the Riz Rouge de Camargue line for a long time now and I love it to bits. What I also love is the free provencal basket that I got when I bought my stuff. So pretty. And there’s a Cherry Blossom bath gel in it. I love this line – it smells so fresh and spring-y. I have the cherry blossom hand cream and I use it every day. I haven’t tried the bath gel yet so I’m excited to try this one. What I like about this basket is that the free products are in good travel size bottles. They are not samples – they actually sell the products in that format. Very convenient for weekend trips and you can reuse the bottles for future travels. I already wrote about how I love their Beurre de Karite line here. I already love their Riz Rouge line for the face and I think I’m fast falling in love with the Cherry Blossom one. 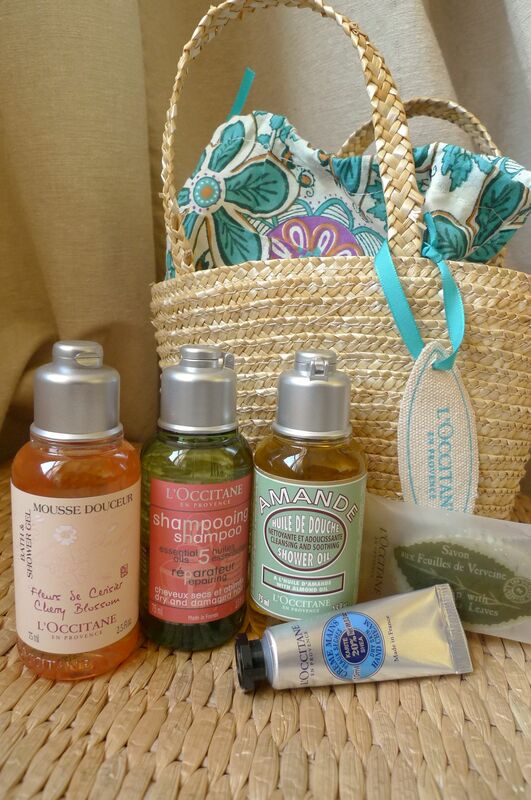 I suggest you go to your nearest L’Occitane store and try out their products. I like them better than the Body Shop – and not because it’s French but because their products are really of good quality (even going up to AOC level) and you really get more for what you pay for. Learn more about them and their products here. Winter is such a drag. Everything’s gloomy and drab. Dry skin, cracked lips, unmanageable hair. 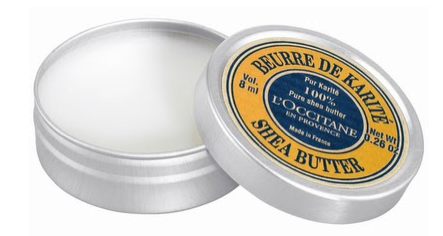 One good solution for all these 3 problems is L’Occitane’s 100% Shea Butter balm. I use a couple of L’Occitane products and this is one of my favorites. I initially bought this small 8ml pot as lip balm. The small chic aluminum container is very handy even if you have a small bag. It’s perfect for travelling. When you first open it, the texture is like wax: very hard. But after rubbing your finger on it or getting a bit and rubbing it on your palm before applying it becomes very light and easy to apply. It’s also very useful for dry spots on hands for example. Or on the nose after all the sneezing and tissue irritations. I read in a magazine that some hair stylists dabs just a bit of this on the ends of the model’s hair to moisturize and style at the same time. I haven’t tried using this that way yet since I have the shea butter hair cream too. All in all, this is a very good product. Although 5€ for an 8ml pot is a bit pricey I’d say it’s worth the money. Despite the harsh winter winds my lips are crack free and as soft as a baby’s bum. Plus it lasts for a long time. A soaring 5/5 in my rate book.